The new year brings with it a new diet to add to the range of Orijen's dry cat food recipes. Orijen is based in West Canada and sources all the ingredients for their food from local farms, ranches and pastures. This isn't made into your run-of-the-mill food though, the Orijen standard is to only include ingredients which would mirror what the animal would eat in the wild. If your pet didn't just have to sit and wait for their food, they would be out hunting and foraging. Based on the diet of a wild cat, their intake would consist of around 80% meat to 20% fruit and vegetables, which is what you will find in every bag of Orijen food. Because each bag is filled with these quality ingredients and their nutritional values, there is less of a need for synthetic ingredients being added to the food to give your cat what she needs. 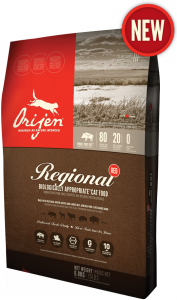 Regional Red is Orijen's new cat food and is available in 3 bag sizes including a 340g bag, so you can give your cat a taste first before you take the plunge to a larger bag. We don't think there's much chance that your cat or kitten will turn his nose up at this food, especially when the included meats sound like a meal you would get in a fancy Canadian restaurant. Black Angus beef, wild boar, lamb, heritage pork and bison are the meats on offer in each meal, all sourced from Alberta and served alongside a selection of fresh fruit and vegetables from British Columbia. There is nothing to stop any of these ingredients being found on menus either, every one has been approved fit for human consumption. It has been a busy start of the year for the high quality natural pet food producers Natures Menu. They have just released a variety of new wet and dry food for dogs and cats under the Country Hunter Seriously Meaty range. Natures Menu have been producing pet food since 1981 and have always stood by their belief that our pets shouldn't be fed processed food. All they produce includes sustainably sourced ingredients with no hidden extras. This new range is no exception, and is available now for your pet to enjoy. The first in the Seriously Meaty range is their dry dog food. Each box is filled with freeze-dried chunks of raw meat and crunchy nuggets of baked oats, vegetables and fruit. The range features 3 delicious flavours – Duck with Plum, Rabbit with Cranberry and Venison with Blueberries, each of which has been chosen due to the high nutritional value gained from the combination of rich, mineral packed meat and the antioxidants gained from fruit and vegetables. The raw meat has been freeze-dried to keep the flavours and goodness inside, which could be otherwise lost during cooking. The range is available to buy now in single 700g boxes so why not try your dog on each recipe and see if you can work out which one they enjoy the most. For the dog that prefers a wet meal, the Seriously Meaty range includes a grain free canned selection as well. Each one of these is filled with a 43% real meat content of either Duck with Chicken, Rabbit with Chicken, Salmon with Chicken or Venison with Chicken. The rest of the can is filled with herbs and fresh vegetables. All these ingredients are first added to the can raw, which is then steam-cooked to preserve as much as the goodness and flavour as possible. The combination of the selected meat and vegetables makes a complete and balanced meal with the vitamins and minerals a dog requires for a healthy life. Imac was established in 1964 and boasts the fact that the entire production cycle of all of their products is done in their warehouse in Italy. They produce a range of products for dogs, cats, fish, birds, rabbits, hamsters and other small animals, which includes a variety of cages, carriers, kennels and litter boxes. This month they have released 2 new cages, one for hamsters and one for rats. Each cage has been designed to provide a spacious living area for your small pet without being too heavy or difficult to assemble. Because of the space offered by each cage, you have the ability to add any other accessories which you like to keep your little furry entertained. Criceti 16 is a hamster cage which comes complete with all you need to get started, except for the hamster of course. The brightly coloured home is bundled with 2 raised platforms, a hamster house, 2 tubes, a feed bowl, exercise wheel and Tibetan bridge which links the 2 platforms. An ideal home for multiple hamsters. The Rat 80 is the other new cage available to order now. This cage comes complete with a raised platform, hanging rat tube and feed bowl.